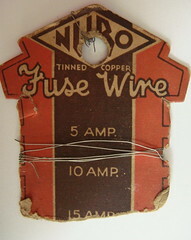 NUBO TINNED COPPER FUSE WIRE. Big world cup match on in an hour and this looks like a football shirt (if you squint your eyes). Another piece of Wire sold on a card for my "Ways to Sell Wire" collection.